If you don't really want to read about stool, you might want to stop here. It's kind of an obsession of ours these days and we tend to forget that most people don't want to know. So for those of you who don't want to know, here's a picture of a cute baby. They increased Blaise's enteral feeding to 5 mL an hour on Thursday, which freaked us out a little bit because previous increases had been .5 mL, not 1 mL. It sounds like a little difference, but it works out to nearly an ounce a day. No big surprise, her stool output went way up, but not so high that the doctors want to back off. I was sure we were hitting the wall, but apparently Blaise has a different idea of where the wall is than I do. The problem is that as her output goes up, so do the chances of her bag leaking and needing to be replaced. Bag replacements are a big pain. Blaise yells all the way through them and the more she yells, the more she stools and the more she stools, the more likely it is that the bag will leak. We did 4 bag replacements in 6 hours yesterday. I actually had a dream about replacing an ostomy bag last night. Just in case anyone was wondering whether I was in denial, it seems like even my subconscious has reached acceptance. Okay, I'm done talking about weird baby poop. We also heard yesterday that Blaise's surgeon and her GI specialist had discussed the possibility of sending her home before her surgery in April. They decided against it only because she would be the smallest baby they had ever sent home on PN. (There are some logistical roadblocks, too.) We're not really disappointed because this wasn't a possibility we had ever entertained, but it's still nice to know that she's so strong and healthy that even her doctors forget how tiny she is. Blaise is weighing in at 5 lbs. 8 oz. as of last night. She's still on the small side for her corrected age, but she has started outgrowing the preemie clothes. Weirdly, she's getting longer, but not really chubbier. "Willowy" isn't really a body type that runs in either of our families, so we have no idea where this is coming from. 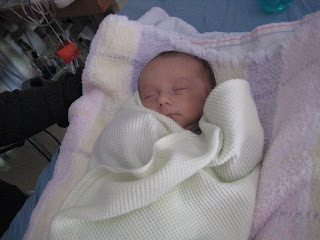 It also means that she's too long for a lot of the preemie clothes, but the newborn sizes just hang on her. We're taking the biggest step yet in terms of pushing her feeds. She's been getting 11 mL by mouth every four hours and 4 mL per hour through her g-tube for almost a week. Today she went up to 5 mL/hour on the g-tube. All of the previous increases have been half a milliliter an hour, so a full mL/hour increase seems huge to us. We'll see how her little gut handles it. In more fun news, Blaise and I made a birthday card for Ben with her footprints on it. She was amazingly calm throughout the footprint-making process. No fussing about the paint on her feet or about having them washed off. Once we finished and got her bundled back up, though, she fussed for 3 hours. Maybe she wanted to make more footprints. Blaise has been on Omegaven for almost 2 weeks now and it seems to be going well so far. Her bilirubin levels went up a little bit right after she started (from 2.2 to 2.3, normal is 1) and as of yesterday, they had gone down to 1.8. They might still go up again before they go down for good, but we'll deal with that when it happens. For now, it's at least a sign that her liver isn't getting worse. Hooray for fish oil! This all makes us remember how lucky we are that Blaise was born in the Children's/Brigham and Women's complex and that she is able to get these treatments right away. Until a few years ago, the prognosis for a child with short bowel was very poor; there was just no way to get kids off parentral nutrition fast enough to prevent liver failure. With Omegaven, kids are able to live long enough on PN for their bowels to adapt and allow for normal (or quasi-normal) eating. Even now, you can find horror stories from parents about how their doctors or hospitals or insurance companies kept them from getting Omegaven. We didn't have to fight with anyone or move across the country to find someone who could help Blaise. Within days of her birth, the people best equipped to help Blaise already knew about us and had stopped by her bed to say hello. The chances of any child being born with a mid-gut volvulus in the absence of malrotation are extremely small. The chances of that child being born in exactly the right place at exactly the right time are smaller still. I think I'm going to go buy a lottery ticket. Friday was Blaise's due date. It's hard to remember a time when we thought we wouldn't get to meet her until now. I actually expected to deliver after her due date, but, well, let's just say that none of this is in those "What to Expect" books. It's going to be more difficult to have her in the hospital because we've been able think of these last 7 weeks as a special preview. Now that we've hit the point when she was supposed to be here and when she was supposed to come home, we might start to feel a little cheated sometimes. It's also going to be different in terms of her development. Before, any milestone she hit was early, but now there are things she should be able to do on a particular timetable and it is possible for her to get behind. It's not uncommon for babies who are hospitalized to get a little delayed. We'll do what we can to mitigate this, but we can't change the fact that her environment is weird, that some of her awake time has to be spent doing bag changes or that when we do leave her room, we have to take the IV pole with us. That said, I'm happy to brag that Blaise's head control and neck strength are excellent and her tummy time goes very well. She's also well over 5 lbs now (2420 grams = 5 lbs 5 oz), so she's a little on the small side for her corrected age, but not too tiny. 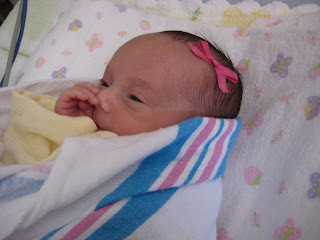 And did I mention that she's the cutest baby in the whole hospital? Because she is. There are more photos on the photo site to prove it. Blaise has hit the 5-pound mark (2270 grams =4.994 lbs; we're going to let her round up). As of yesterday, she was receiving 10 mL (about 2 teaspoons) of milk by mouth every 4 hours and 4 mL/hour through her g-tube for a grand total of 156 mL (just over 5 ounces) for the day. She's using enough milk that they've asked me to bring in some of our frozen stash twice now, in addition to keeping the milk that I pump at the hospital. This is a long way from 1700 grams and 0 mL of milk. Her weight gain is almost all due to her TPN, not the milk itself, but it's gratifying to have her getting the milk. I think we're about to hit a wall on her feeds and that we may have to back off for a while and try again, but that's the game here: Not a sprint, not even a marathon. Marathon training. She would be gaining a lot more weight, but our soon-to-be-former preemie has developed a serious case of newborn rage. Her lovely quiet alert periods after bottles have turned into loud aimless crying fits. Remember my post about being glad to hear her cry? Well, five weeks later, the novelty has worn off. The nurses, the doctors, the other parents, everyone keeps telling us that this is a great sign. Only healthy babies can cry like that. Of course, all I can think sometimes is "No! Stop crying! You're burning calories!" Blaise would like to wish all of you a very happy Valentine's Day. Ben and I echo the sentiment. Yesterday Erin & I had another "team meeting" to discuss Blaise's progress with her various care-takers. This one left us feeling distinctly better than the first meeting we had; Blaise's outlook is still uncertain (and complex) but I think we both were left feeling like her team has the situation pretty well in hand. The plan is this: Assuming Blaise's bilirubin levels go down to normal now that she's on Omegaven (which they should) her surgery in April will attempt to reconnect her small bowel with her large bowel, taking the ostomy away and leaving her with a continuous GI tract. The word "attempt" is in there for a few reasons: Before they do any of this, they'll do a contrast study in mid-March to see how much large bowel is there, and whether or not it has any strictures or blockages. It might not be complete and it might also be compromised in the same way her small bowel was. The other part of this is that having a continuous GI tract comes with its own worries. The large bowel can help absorb water and electrolytes, which is why her surgeon would try to connect even a small portion of large bowel to what's left of her small intestine. Thing is, the nature of enteral feeding (tiny amounts at a time) can make it difficult for the large intestine to work properly. This can lead to blockages in the colon, resulting in further damage to the large AND small bowel if you're not careful. If they do decide to reconnect her, we're going to have to be very careful to make sure this isn't happening. If it does happen, we're right back where we started (or actually, a bit worse). Lots of stuff to think about and try to prepare for, but the good thing about all of this is that there's a plan. The first time her surgeon operated, no one had any clue what was going on in her abdomen. The next time, we're going to find out everything we can beforehand. There's still uncertainty...in particular, if her bili levels don't drop as soon as we'd like, her surgery may be delayed by 4-6 weeks. That's all in the service of making sure she's as strong as she can be, though, which sounds to us like a great reason to wait. Besides surgical details, her dietitician seems happy with her growth. Her weight (now 2.23kg, or ~4lbs, 14oz) has fluctuated a bit since she's moved to the floor, but her length and head circumference are pretty much on track. It turns out that these are more stable measures of growth, since weight can depend a lot on hydration and calorie burn during the day (due to "appropriate crying," for example). After the meeting yesterday, we also had a very nice surprise waiting in Blaise's room. 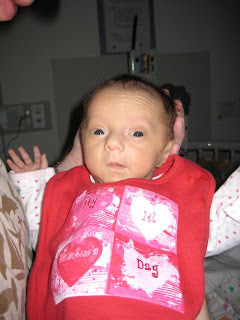 It was a Valentine's Day present from one of her old roommates in the NICU. 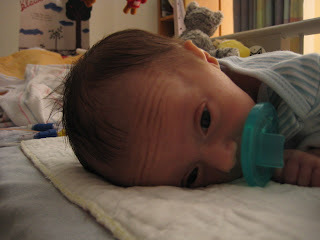 His name is Malachi, and he and Blaise were actually due on about the same day (2/20/09 for Blaise, 2/24/09 for Malachi). While Blaise was just about 7 weeks early, Malachi was almost 14 weeks premature. The NICU isn't the easiest place to strike up a conversation, but you can't help but get to know your neighbors. Malachi's grandmother was in pretty much every day to see him, even though she lives in Springfield (over an hour away from Boston), and while we never wanted to pry into Malachi's situation too much, we were always pulling for him whenever he was having another procedure. Malachi was scheduled to leave the NICU right around the time Blaise was transferred to the floor, and his family was understandably nervous about it. In their case, transfer meant heading for a hospital out in Western Mass. which can't help but feel like a downgrade in care given how great everyone is at Children's. We wanted to do something to say goodbye and good luck, so after Blaise was transferred we gave them a onesie from my lab and a gift card from Borders, since we noticed that they were all serious readers. Anyway, yesterday afternoon we returned to Blaise's room to find a set of beautiful outfits for our baby, in preemie sizes that should actually fit! She's also got a great Valentine's Day bib to wear and a nice note from her friend Malachi. We both really hope he's doing well (either at Children's, the hospital in Springfield, or maybe even at home) and it was great to know they're thinking of us, too. I have to say, if we could have avoided being part of this club, we would have...now that we're in it though, it is true that the membership's great. Melting snow. Slightly warmer days. Crocuses (not that we have those yet). More importantly, and more accurate than the groundhog: Pitchers and catchers report for Spring Training today. We'll have to get a radio for Blaise's room and start explaining why one might bunt. In other news, Blaise has officially started on Omegaven and we are hopeful that this will improve the state of her liver or at least prevent any further damage. She continues to gain weight (except on very fussy days) and is approaching the 5 pound mark. We're also getting longer stretches of awake and calm time and she's starting to protest more when people have to fuss with her, what one of the nurses called "appropriate crying." I'd be mad about someone waking me up to poke at my belly too. 2.0 and 2.2. Those are the results of Blaise's last two lab tests for bilirubin levels, which puts her over the threshold for "compassionate care" administration of Omegaven. Erin & I signed the consent form today, spoke with Dr. Puder a bit more about the treatment, and now we wait. Actually, we don't wait very long at all for Blaise to get Omegaven. It'll be substituted in to her PN in place of the old lipids tomorrow. It turns out that Children's doesn't need to get FDA approval for every child they want to give it to (like we originally thought). Everything's all ready to go right away since the Omegaven study is happening at Children's and they have clearance from the Children's Internal Review Board (or IRB...one of the few acronyms we were familiar with before all this began). So what are we waiting for? Well, we have to wait for her to get better. The typical pattern the group at Children's has observed to date is that after Omegaven's administered, bilirubin levels get worse before they get better. We're not talking catastrophically bad, but there's a definite spike after treatment's initiated, followed by a steady reduction. They all know it's going to happen, we know it's going to happen, but I'd be lying if I told you I wasn't scared. Turns out you can look at a graph and measure the error bars to your heart's content and it doesn't make you feel any better about your kid's liver not working the way it should. There's a psychological phenomenon called pareidolia. It refers to people's tendency to see meaningful patterns in stimuli that are actually completely random. It's the word we've picked to describe what's happening when you see a face in the clouds, or feel like you hear a voice in radio static. Pretty pervasive, and pretty much impossible to shake even when you know you're probably fooling yourself into believing something's there. I bring this up because I wish I knew how to get rid of it. When you know you're daughter's probably going to start looking jaundiced soon, your ability to see yellow suddenly skyrockets. I know the lab numbers mean more than her skin color...babies with a different complexion can look completely normal even when they're bilirubin level is through the roof. Still, it's spooky to feel like she looks different. I'm constantly looking at the whites of her eyes to see if I feel like they've changed, and I keep checking my own hand and arm to see if her skin really looks that much different than mine. To be honest, I don't think I can tell anymore...my brain's sick of trying to process skin color at this fine of a grain so I suspect it's given up. Of course, Blaise isn't worried in the slightest. She's mostly working on fine-tuning her ability to detect exactly when we've begun to think about getting some coffee so she can wake up and fuss. In other news, she officially went of her last monitor today! No more pesky pulse/ox light around her foot...of course this means her toe will no longer glow with an unearthly red light. It was kinda cool through the blanket. She looked a bit like E.T. They'll still do the occasional spot-check to make sure she's doing alright, but her blood-oxygen levels have been at 99% or 100% for ages now. So one less line, which means it's even easier now to scoop her up and dance around for a bit. Progress rocks. No, don't worry, I'm not going to post pictures of Blaise's tummy. Those are really not something most readers of this blog want to see. Although her umbilical stump finally fell off last week, so now she has a cute little belly button between her g-tube and her ostomy. Kids who have to spend a long time in the hospital tend to fall behind developmentally because their experiences are very atypical. To mitigate this, the hospital has "child life specialists" on each unit whose job is to keep an eye on the non-medical aspects of kids' development. The woman who has this job on Blaise's floor is awesome. She's very dedicated to helping families do what they would do at home and has been incredibly supportive of our preferences for Blaise (e.g., no TV, lots of books, etc.). One thing that healthy newborns need to do is spend at least some time on their bellies (a.k.a., tummy time) to help build up early motor skills. I didn't know how we were going to do this with Blaise because of all the extra stuff on her belly, but I asked the child life person and she told the physical therapists about the situation. The PTs came and made little foam supports for Blaise's g-tube and told us not to worry about the ostomy, so we've had some tummy time in the last few days. A full set of pictures will be on the photo site soon, but here's a preview. The big news of the day is that April 6 is the likely date for Blaise's next surgery. This surgery would reconnect her small and large intestines and, possibly, closing up her ostomy (the part of her small intestine currently coming out of her belly, which is how she poops). Some families elect to keep the ostomy open even when the intestines have been reconnected because ostomy output can be easier to manage than chronic diarrhea. We'll be talking with her doctors more about these options once we know how much of her large intestine is intact. One thing that we know will continue is her enteral feeding. Blaise has a g-tube going directly into her stomach through which breast milk is continuously pumped at a very slow rate (currently 2.5 mL/hour). The intestine adapts when it's in contact with food, so continual contact equals maximum adaptation. Hopefully the ridges in her tiny bit of intestine will get deeper as part of this adaptation, leading to "cavernous villi." (Ben points out that "cavernous villi" could be a phrase from a Gothic novel.) Several people have asked when the g-tube is going away and the answer is probably not for years. She gets to drink some milk from a bottle and, hopefully, will be able to eat at least some food, but this continuous enteral feeding will persist for a long time. The pump runs on batteries and is very portable, so she won't have to spend all her life indoors or unable to do normal kid things. Other kids take ballet and travel abroad while getting continuous tube feeds. We hope Blaise will, too. Speaking of tubes.... Ben and I don't watch much TV and we're pretty anti-TV for babies and toddlers, so imagine our annoyance when we kept coming into Blaise's room to find her TV on. It turns out that some of the volunteer baby-holders (Yes! You can volunteer at pediatric hospitals to hold the babies! I wish I had known about this years ago!) settle in with a baby and turn on Maury Povich. From my point of view, this kind of defeats the purpose for both the baby, who should be talked to or sung to or something, and the volunteer, who could watch Maury at home. We told the child development specialist that we didn't want Blaise's TV on and she said she would make a sign to remind people. We thought it would just be a small note but it's a huge piece of paper that covers the whole screen. The doctors and nurses all think this is hilarious. We watched some of the Super Bowl at the hospital and some at the very atmospheric Longwood Grille in the hotel across the street because the cafeteria at Children's doesn't have a bar (and closes at 7 on Sundays). Frankly, if you have a kid in Children's, I think you should be able to get the occasional drink without going to the hotel across the street, but I guess something about being a pediatric hospital makes them think that serving alcohol is inappropriate. 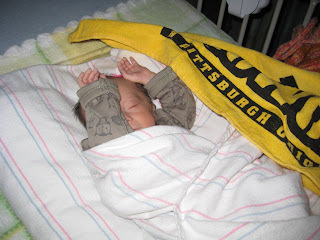 It was a great game and Blaise relished the Steelers win, as you can see. 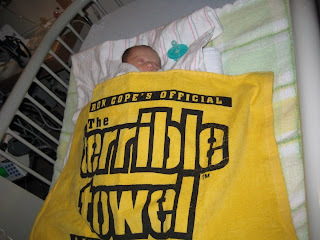 We tried to get her to grasp onto the Terrible Towel, but she wasn't cooperative. Cheering can be very tiring. Blaise is one month old today and it's pretty amazing just how much we've all been through in such a short period of time. If you had told me a month and a day ago that this was coming, I'm not sure I would have believed you. At the very least, I wouldn't have believed that we would all come out the other end a little the worse for wear, but doing okay. Because I'm not sure I can process it all in the abstract, I've compiled some numbers to give a sketch of Blaise's first month.